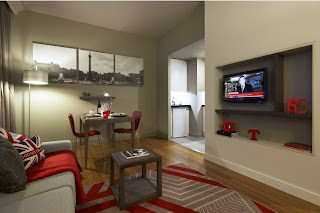 Even though Citadines Trafalgar with its 187 apartments offers a near unrivalled location in Central London, it is ironic that it could not easily receive the basic Freeview service because of problems of line of sight to the transmitter. For Airwave, the solution was simple and the new AirSTREAM system has been installed which converts digital satellite (FreeSat) to digital terrestrial signals onto the hotel network. Because of the international guest mix, the same equipment is used to retransmit international channels in the same way. There is no requirement for any set top box at the headend and the system is completely digital.